Welcome to Benin! Our tour guide will meet you at Cadjehoun International Airport of Cotonou. Transfer to our hotel. During a welcome meeting your guide will provide you with useful information about your stay in West Africa and you will be given details of the itinerary. After breakfast at the hotel, a one-hour drive brings us to Porto Novo. While Cotonou is Benin’s economic heart, seat of the government and the largest city, Porto Novo is the official capital. In comparison with Cotonou’s modern skyscrapers and metropolitan hustle and bustle Porto-Novo seems like a dreamy provincial town. Today the town has about 250.000 inhabitants and is considered the country’s artistic and intellectual centre. Porto-Novo was founded in the 16th century by the Gan people and was named after the town of Porto when the Portuguese established a slave-trading post here. During the French colonisation Porto-Novo became the capital of French Dahomey. But having only a small and shallow port it quickly lost all importance to Cotonou at the beginning of the 20th century. Porto-Novo is situated on the shores of the Nakoué Lagoon only 15 km from the Nigerian border. We will spend the morning exploring Porto-Novo, taking in the highlights of its sprawling market and its unique Grand Mosque. Originally a church, this multi-coloured building possibly provided the inspiration for the colourful churches of Salvador de Bahia in Brazil, linked to Benin by the trade in slaves who were mostly being taken there. The variety of colours of this impressive structure which today houses the Grand Mosque can hardly be surpassed. After a stroll through the close-by busy market we will also visit the fascinating Musée Ethnographique, which contains a large collection of Yoruba masks, as well as a number of artefacts relating to the history and traditions of Benin’s tribal groups. A museum guide will introduce us to the main ethnical groups and explain their rites and customs. The museum is divided into three subjects: birth, life and death. Here we will also get solid information on voodoo religion. We then drive west to the shores of Lake Nakoué, where we take a boat ride out to the stilted village of Ganvie, reputed to be Africa’s Venice. If there is a town in Africa which can fairly be compared to Italy’s famous lagoon city it surely is Ganvié, sitting pretty on the lake. The town was settled in the 16th century by the Tofinou people, fleeing the slave traders of the Portuguese and the bloodthirsty kings of Dahomey. The name means “the people are saved”. According to legend the king of the Tofinou whose lands originally lay in the region around Allada turned himself to an egret to save his people. He flew across the country looking for a suitable place where his people could hide from the slave raiders of Dahomey. He finally came upon some islands in the heart of Lake Nakoué and he knew at once that this is the right place. A religious tradition did not allow the enemies to pursuit their human prey on the water. But then he had to solve another problem: how could he get his people there? Of course, if you can turn yourself into an egret then you can also turn yourself into a crocodile. And that is what he did and all the crocodiles of the lake helped him to carry the people and the construction material on their backs out to the islands. To this day the town can only be reached using canoes and boats. During our two-hour ride we see fishermen casting their nets while white egrets are watching them attentively. The 35000 inhabitants of Ganvié make their living primarily from fishing. Our captain navigates us ably through the floating market where women wearing huge straw hats offer their goods for sale. Tasteful meat and fish dishes are displayed in colourful enamel pots and exotic fruits and vegetables are piled up in large plastic bowls. Firewood being a rare item is sold like hotcakes. In Ganvié there are restaurants and hotels, a post-office, a dispensary and schools. A one-of-a-kind filling station supplies the town with fresh water from a deep well. Returning to the shore we make for the town of Ouidah where we spend the night in nice beach hotel. This morning we learn more about the infamous period of slave trading. When the Portuguese arrived on the shores of today’s Benin in the 15th century they initially were interested in the trade in gold and ivory. But soon, with the increasing demand for cheap labour in the Americas, the Portuguese and the other European nations who joined them in making regular visits along the coast started the Trans-Atlantic slave trade. African slaves were driven from the north of present day’s Benin and neighbouring countries to Ouidah, capital of slave trade, to be sold at the auction square, also known as Place Cha Cha. This place is located in front of that most infamous of slave traders, Don Francisco Felix de Souza. Bruce Chatwin’s famous novel “The Viceroy of Ouidah” which German director Werner Herzog turned into a movie called Cobra Verde starring Klaus Kinski is based on Don Francisco’s life. From the Place Cha Cha the prisoners were brought to a dark room called the Zomai, where they were kept prior to departure. Zomai means “where the light does not go”. Many of the victims were held in this obscure hut for months in inhumane conditions. The final stage of the slaves’ last trek on African soil was 3156m long and led to the beach from where they were transported to the waiting sea vessels. Today we walk along the Route de l’Esclavage lined by dozens of statues and monuments depicting scenes of the slave trade. We pass by the Tree of Forgetfulness which the slaves had to circle several times in order to forget their African identity. We see the Tree of Return which the slaves would circle three times to guarantee that their souls would find their way back to their homeland. A mass grave into which dead, but also weak prisoners were thrown is marked by the Zoungbodji memorial erected in 1992. The slaves’ terrible walk ended on the shore. At the head of the beach a high arched gateway called the Gate of No Return was constructed in 1995 by UNESCO. It symbolizes the hopelessness and despair of the people having arrived at this stage knowing that they will never see again the land of their ancestors. But the memorial also represents tolerance, mutual understanding and the peaceful co-existence of nations and races. Ouidah is not only a town of historical importance. It is also a religious centre of Voodoo. It is considered to be the spiritual home of Voodoo. Every year on 10th January a Voodoo festival is hold on the beach. On this occasion Voodoo practitioners from around the world come to Ouidah to worship their gods and to make sacrifices. We also visit the remarkable Python Temple dedicated to Ouidah’s favourite god Dan. Take a picture with a snake around your neck! This brings good luck and gives you strength and fertility! We end our city tour of Ouidah at the Sacred Forest dedicated to king Kpassé, Ouidah’s founder. Legend has it that the king once disappeared in the forest and turned himself into an iroko tree. Since this time the iroko is considered to be sacred. Throughout the park is a number of sculptures symbolizing the most important Voodoo gods. It is the only sacred forest in Benin and Togo which may be entered by non-initiated persons. Later we head east to the shores of the Gulf of Benin at Grand Popo where we will witness a Zangbeto ceremony. The Zangbetos are referred to as "guardians of the night” who act as a kind of policemen patrolling the streets at night. They have their own secret society and their temples are barred to all uninitiated. If a non-member enters one of their temples it would be on pain of death. Before they begin to work at night they dance to get in contact with spirits and gods. The whirling haystacks have some surprises on store! Be prepared for a magical spectacle accompanied by the hypnotic beat of the drums! After breakfast we leave Grand Popo crossing into Togo. Heading west towards Togoville, we stop at Glidji, a small town mainly inhabited by the Gan people. On arrival we will meet the local chief King Gê–Fioga Sèdegbe Foli-Bebe XV. In 1997 he was designated as the spiritual leader of about 350.000 Gan citizens. This talkative chief studied engineering in France and worked there as a bridge engineer before becoming a king. He has a large collection of insignia that he likes to show to his visitors. Among his precious exhibits there is an ornamental rod with a royal inscription that was offered to his ancestor Fio Agbanon I by Queen Victoria on the occasion of the abolition of slave trade. Not far away from Glidji on the northern shore of Lake Togo lies the historic town of Togoville. In 1884 Chief Mlapa III signed a peace treaty with the representative of the German Empire, Gustav Nachtigal, granting the Germans sovereignty over Togoland. In 1984, on the occasion of the 100th anniversary of the treaty the former minister-president of Bavaria Franz-Josef Strauß inaugurated a memorial in the town centre. We reach the town by a boat ride across Lake Togo. We first visit the German-built Cathedral Notre Dame sitting on a large terrace, dominating the lake. It is an impressive building dating back to 1910 decorated with paintings of African saints and a statue of Our Lady of Lake Togo. In 1940 the Virgin Mary allegedly appeared on the lake, prompting the building of a shrine and the Pope John Paul II to visit Togoville in August 1985. On the opposite side of the church we see a well built in 1910 which provided the water for the construction of the church. Togoville consists of a Christian and animist quarter. From the church we continue to the animist part of the town. We pass by many Voodoo shrines and fetishes. Togoville is known for its voodoo fetishes. In the Xetsavi quarter, there are two voodoo fetishes, one male and the other female. In the centre there is a tall old silk cotton tree which serves as a meeting place for the elders. In this quarter we also meet the most important voodoo-priestess in town, Maman Kponou XIV who will celebrate a welcoming ceremony for us. Upon arrival at her temple we have to put on sarongs and remove jewellery and watches. Then we need to kneel down next to a fetish and ask for permission to enter. Maman Kponou XIV is also the guardian of the Sacred Forest which can only be entered by initiated persons. She is a wise and charismatic woman telling us about her work as a priestess. Experience authentic Voodoo! From Togoville we continue to Lomé. On arrival at our beach hotel you can take a swim in the ocean. This morning we explore Togo’s capital Lomé. The town was founded in the 18th century by the Ewe people and became seat of the German colonial administration in 1897. Due to its picturesque location on the Gulf of Benin and some well-preserved colonial buildings Lomé is one of the most beautiful cities in West Africa. In the afternoon we return to our hotel where you can enjoy the fine white sandy beach and the deep blue ocean. After taking breakfast at our hotel, we leave Lomé and the beautiful beaches of Togo heading northwest to the Togo Mountains. On our way we pass Mount Agou, at 986m Togo’s highest peak. There are many teak plantations along the road. Teak was introduced to Togo by the German colonists. On a good tarmac road we reach the town of Kpalimé with its impressive catholic church. Climbing from here through the lush tropical forests of western Togo we reach Kloto, where we stay at a basic campement that was built by the Germans as a hospital and later has been transformed into a campement by a Lebanese business man. This afternoon we spend hiking through the tropical forests and the nearby village of Kouma Konda with a local guide. Our competent guide will show us exotic native plants and introduces us to their uses in traditional medicine, local cosmetics and food. A number of natural colours and dyes used by local artists whom we will meet on our walk are made of tree bark or petals. Along with cocoa, coffee, ladies’ fingers, teak, kola trees, bread fruit and calabash trees he also introduces us to the versatile oil palm used in making oil, soap, liquor, construction material and fire wood. A magnificent view point offers a stunning view of the Akwapim Mountain range which stretches from the southeast of Ghana across the central region of Togo into the north of Benin. On a clear day we even can see Lake Volta! This evening there will be the opportunity to see a traditional dance being performed in the village featuring a fire-eater. Let yourself be surprised! Only a few kilometers from Kloto there is a border post where we cross into Ghana. Our first destination in Ghana is Mount Afadjato, at 885m the country’s highest mountain. Its forested slopes lie very close to the Togolese border. Since 1998 the area has been protected with funding of the government of the Netherlands. A good, broad hiking trail has been laid out by which Mount Afadjato can be ascended as a two hour round trip. Reaching the top we are rewarded by a fantastic view. The reserve is home to several mammals like duikers and colobus monkeys, as well as more than 100 species of butterflies and about 90 bird species. Returning to our bus we then continue to the small village of Wli, situated close to Hohoe. The Wli waterfall is formed by the river Agumatsa and therefore is also called the Agumatsa waterfall. The Wli Falls lie on the Togo border and is Ghana’s highest waterfall and one of the largest in West Africa although nobody seems to agree how high it really is. The water cascades down on the Togo side before a final descent of about 60m on the Ghanaian side. A 45-minute-walk on a flat, easy footpath takes us to the waterfall, where an impressive bat colony populates the steep walls. Nine wooden bridges are constructed over the small river winding through the giant jungle trees. In the afternoon, when the sun shines on the water, there is a beautiful rainbow over the natural pool: it is the perfect time to take great pictures. There is an opportunity to swim in the natural pool but depending on the season the water is rather shallow. Nevertheless, you can take a refreshing dip on a hot day! Today we leave Ghana’s fascinating mountain area but not until we have visited another highlight of the Volta Region, the Tafi Atome Monkey Sanctuary. This eco-tourism project was created in 1993 by the villagers of the eponymous community with the assistance of a Peace Corps voluteer to protect the sacred Mona monkeys from poachers and other enemies. Legend has it that the ancestors of the modern villagers migrated to Tafi Atome from the Brong Ahafo Region about 200 years ago and brought with them fetishes for the monkeys and tortoises living in the surrounding forest. For a long time this belief protected the animals but with the spread of Christianity the traditional customs lost their importance and many primates were killed for food, so that by the late 1980s the monkey population had dwindled badly. The project seems to be successful for now the population has increased considerably to more than 350 animals split across four groups. On a guided walk we explore the sanctuary behind the visitors’ centre and hope to get a close encounter with the animals. Later today we continue our journey via Ho and Sogakope back to the coast. The Keta Lagoon is Ghana’s largest lagoon at 40 km long and 8km wide. A narrow strip of sand separates the shallow lagoon and the wild ocean. The brackish water of the lagoon is rich in fish which makes the area a genuine paradise for anglers and fishermen. The shores and islands in the lagoon are home to a large number of bird species. Keta Lagoon is the most important wetland in Ghana and a rewarding site for birdwatchers and ornithologists! Due to its unique location the town of Keta and its surroundings have attracted the attention of European merchants over the past three centuries. The Keta Lagoon became their busy trading post and stronghold. The first Europeans to come were the Danes who built Fort Prinzenstein in 1784 to protect their interests on the Gold Coast. The ruins of the fortress can be visited near Keta. 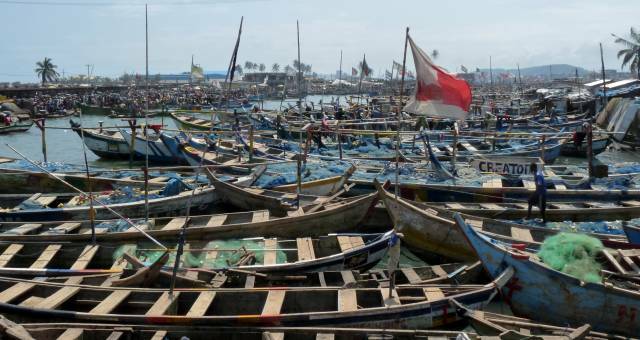 However, Keta’s location also causes some concern that the site is often afflicted by devastating floods and its towns and settlements may be swallowed entirely by the sea. At the end of the day you can enjoy a refreshing bath in the Gulf of Guinea! Keta Lagoon is located only a few kilometers from the place where the Volta River, Ghana’s largest river, meets the sea forming a vast delta. Before leaving the area we take a boat ride in the estuary between Anyanui and Ada Foah. Mangrove forests are straddled along the river banks which host a large number of aquatic birds. We then head west to Anomabo Beach via the towns of Tema and Accra. Our overnight stop today is the lovely Anomabo Beach Resort, situated on a magnificent stretch of wide fine sand beach. Cape Coast lies about 15 km from Anomabo. After breakfast we visit Cape Coast which is situated about 170 km from Accra. It is steeped in history and already existed as a tiny fishing village before the first Europeans arrived. Until 1876 it was the capital of the British Gold Coast colony. Today Cape Coast is still the main town of the Central Region and has developed to a centre of education. With a lot of new impressions we leave the fortress heading back to Elmina. Those who want to join the optional tour will be driven to Kakum National Park situated only 33 km away from Cape Coast. Founded in 1990, this nature reserve, covering an area of 350 km, boasts an excellent tourist infrastructure. Kakum is home to a diversity of plants, trees and animals and protects at least 40 mammal species including the extremely rare forest elephant, forest buffalo, bongo and giant forest hog. 266 bird species are reported, eight of them of global conservation concern (including white-breasted guinea-fowl and brown-cheeked hornbill). Today we drive along the coastal road to Ankobra Beach, a fantastic beach close to the town of Axim. En route we visit the Brandenburg-Prussian Fort Gross-Friedrichsburg overlooking the picturesque fishing village of Prince’s Town, also known as Princess Town and called Prisi in the Akan language. This settlement lies near the southernmost tip of Ghana, Cape Three Points. We have a fantastic view to one of the three points from the beach. Prince’s Town is situated on a picturesque lagoon surrounded by lush mangrove forests and an estuary. The impressive castle, one of two German fortresses in Ghana, is overlooking the settlement. It was built in 1683 as a trading post of the Brandenburg-Prussian Society which was active on the Gold Coast between 1682 and 1732. When the Brandenburgers, who meantime had become a part of Prussia, retired from the Gold Coast in 1717 the fortress was occupied by the local chief John Konneh who established the Gold Coast’s crossroads for smuggling at Prince’s Town. In 1724 the Dutch conquered the castle. The caretaker of Gross-Friedrichsburg, Mr. Joseph, will show us around the ruined fortress and tell us interesting stories about its history. This afternoon we reach Ankobra Beach Resort, our lovely hotel on one of the most beautiful beaches in Ghana. This magnificent resort situated near the Ankobra River estuary offers pure relaxation and comfort. The round hut style chalets, an excellent restaurant, professional service and – last but not least – a dreamy palm-fringed beach make our stay at Ankobra Beach Resort a true highlight of our tour. A day excursion brings us from Ankobra Beach to Beyin and to the Ankasa-Nini-Suhien-National Park. At the small fishing community of Beyin we board a canoe that takes us to Nzulezo stilt village, which lies on the fresh-water Lake Amansuri about 5km from Beyin. Our one-hour boat journey takes us first along a man-made canal which has recently been excavated with the financial assistance of the Dutch government. We then follow the Amansuri River and pass through the swampy Amansuri Wetland dotted with pools where raffia palms and lush jungle grow on the river banks until it opens out on to the vast lake. From a distance we can see the picturesque stilt village which is entirely built on the water. Nzulezo is home to 500 people who live in houses made of wood and raffia. There is a “central street”, a wooden walkway, with houses on either side of it. We walk on the walkway to the school building where we meet the headmaster or the chief of the village. Here we learn more about the history and the culture of Nzulezo. Why the people of Nzulezo decided to build their village above the water remains an open question. There are different legends and one legend has it that the original inhabitants were guided to this place by a snail. Probably the settlement was built on the water because the first villagers wanted to hide away from their enemies. Returning to Beyin we then head northwest to Ankasa-Nini-Suhien National Park, situated close to the border with Côte d’Ivoire. Its 510 square km comprise an area of 175 square km of tropical primary forest which is the largest and best preserved jungle in Ghana. The list of the pristine reserve’s mammal species includes forest elephants, giant forest hog and a number of antelope and primate species. It is destination for bird watchers. Among the reserve’s highlights there are the so-called Bamboo-Cathedral and the Big Tree. The spectacular Bamboo Cathedral, situated about 8 km from the main entrance of the park, is formed by thick strands of bamboo giving it the semblance of a vault or pointed arches of a gothic cathedral. With the Big tree this site has one of the biggest trees in West Africa at 12 meters in circumference and 60 meters tall. Today we discover the nature treasures of Ankasa-Nini-Suhien National Park on a three-hour-walk. Late this afternoon we return to Ankobra Beach. Today our journey takes us back east to the remote villages of Busua, Butre and Dixcove. This area is not only of great historical importance but also boasts some of the most beautiful beaches in Ghana. We first visit the sleepy fishing village of Butre, home to around 400 people who are mostly members of the Ahanta tribe. We climb up the hillside to the ruined Fort Battensteyn overlooking the village and the beach. The fortifications offer a breath-taking view of the ocean, Butre River and the forested slopes along the coast. The fortress was constructed in 1656, in the same year when the Treaty of Butre was signed.The treaty regulated the jurisdiction of the Netherlands and the Dutch WEst India Compana over the settlement and area of the Ahanta ethnic group, creating a Dutch protectorate over the region. The Dutch stayed on the Gold Coast until 1872. We then take a boat ride following Butre River through lush mangrove forests. The area is home to plenty of bird species such as kingfishers, various species of herons and egrets and other water birds. We can also see crabs and mudskippers and - if we are lucky - even crocodiles. In the afternoon there is the opportunity to walk to Dixcove. A 1.5 km footpath takes you from Busua through oil palm plantations directly to Fort Metal Cross overlooking the picturesque fishing harbour of Dixcove. The former British castle, built in 1696, is a UNESCO World Heritage Site since 1979. It is said to have endured more attacks than any other fortress on the Gold Coast. The village is home to 1000 people who live mainly by fishing. Tourism is not very much developed here. Busua is situated near Ghana’s southernmost tip, Cape Three Points. A bumpy dirt road takes us through oil palm and rubber plantations once planted by Ghana’s first president Kwame Nkrumah to the cape. There is an old lighthouse built in 1925, which we can visit. The caretaker shows us around the solar-powered building and introduces us to his work. We still can see the remains of the original lighthouse, constructed in 1875. From here we have a stunning panoramic view. Between July and November we may be lucky and see dolphins and between August and February humpback whales often swim close to Ghana’s shore during their seasonal migration. With a local guide we take a two-hour-walk through the tropical forest of Cape Three Points Coastal Reserve where we learn more about the various plants and maybe spot some of the primates inhabiting the area. Later today we continue our journey to Elmina which we’ll reach in the afternoon. After our visit to the castle you have free time. You may want to linger awhile at the town’s picturesque fishing harbour, situated in front of the castle where the Benya River meets the sea. The harbour is laden with hundreds of colourful wooden boats decorated with beautiful flags. From a bridge over the river you can enjoy a stunning view of the busy life in the harbour. Every morning, when the fishermen come back from the sea, a crowd of people stands on the bridge to welcome them. The catch of the day is unloaded immediately to be sold. Elmina is real fireworks for the senses! Shouting and gesticulating salesmen, pirogues painted in bright colours, the penetrating smell of fish! With the salty taste of the rough ocean on your tongue you make your way through the crowded streets throng of people. Women ably balance huge bowls of barracuda, sardines or shrimps on their heads to bring them to the nearby fishing market. Workers are busy sawing and hammering at the shipyard on the lagoon. After lunch we continue our journey to Accra, Ghana’s vibrant capital city. The last day of our trip sees us visiting Accra. We take a city tour of the two-million metropolis situated on the Gulf of Guinea. Accra was founded in the 15th century when the Ga tribe who lived in this area started to trade with passing Portuguese ships. When the profitable slave business started it took not long that other Europeans appeared on the scene. The Dutch, Swedes, Danes and Britons built massive fortresses in the area of today’s Accra and its surroundings. In 1650 the Dutch and later British Ussher Fort was constructed, in 1657 the Swedish started to erect Christiansborg Castle which finally has been completed by the Danish and in 1663 the British James Fort was built. All three monuments still exist today but only Ussher Fort is open to the public. Christiansborg is the seat of government and cannot even be approached closely and James Fort now serves as a prison. We begin our exploration at Independence Square which is dominated by the impressive Independence Arch with a black star on the top symbolising freedom and justice. The huge monument was erected on the occasion of Ghana’s independence in 1957 and is placed next to a big parade ground intended to hold 30.000 people. From Independence Square we continue to the Kwame Nkrumah Mausoleum. Inaugurated in 1992 Ghana’s first president’s tomb is set in a beautiful park. From there we drive along High Street, passing the old parliament, Holy Spirit Cathedral and the huge walls of Ussher and James Fort until we reach James Town, the old part of Accra. James Town is arguably the most atmospheric quarter of Accra: many colonial-era buildings and colourful markets characterise the townscape and the old fishing harbour is very busy in the morning. We’ll see the 30m lighthouse, the quarter’s landmark. Later today you’ll have time to visit the National Museum. The exhibits include some excellent examples of traditional crafts ranging from a whole array of Kente textiles, carved stools, musical instruments and masks to archaeological artefacts and displays. The afternoon is free until departure. You will have the use of 2 day rooms until the transfer to the airport for the flight home. Our tour ends this evening.